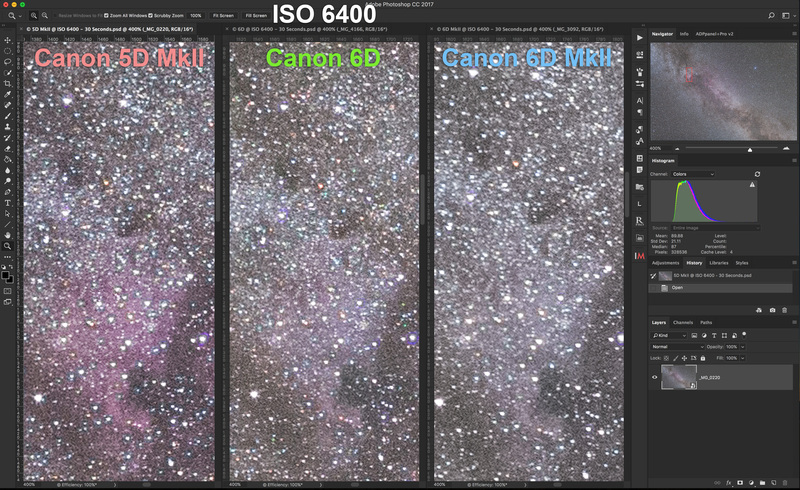 Following up on my earlier tests, I compare the new Canon 6D MkII camera to earlier Canon full-frame models in long, tracked exposures of the Milky Way. A month ago I published tests of the new Canon 6D MkII camera for nightscape images, ones taken using a fixed tripod in which exposures usually have to be limited to no longer than 30 to 60 seconds, to prevent star trailing. Despite these short exposures, we still like to extract details from the dark shadows of the scene, making nightscape images a severe test of any camera. I refer you to my August 9, 2017 blog Testing the Canon 6D MkII for Nightscapes for the results. The 6D MkII did not fare well. Here I test the 6D MkII for what, in many respects, is a less demanding task: shooting long exposures of deep-sky objects, the Milky Way in Cygnus in this case. Why is this an easier task? The camera is now on a tracking mount (I used the new Sky-Watcher Star Adventurer Mini) which is polar aligned to follow the rotation of the sky. 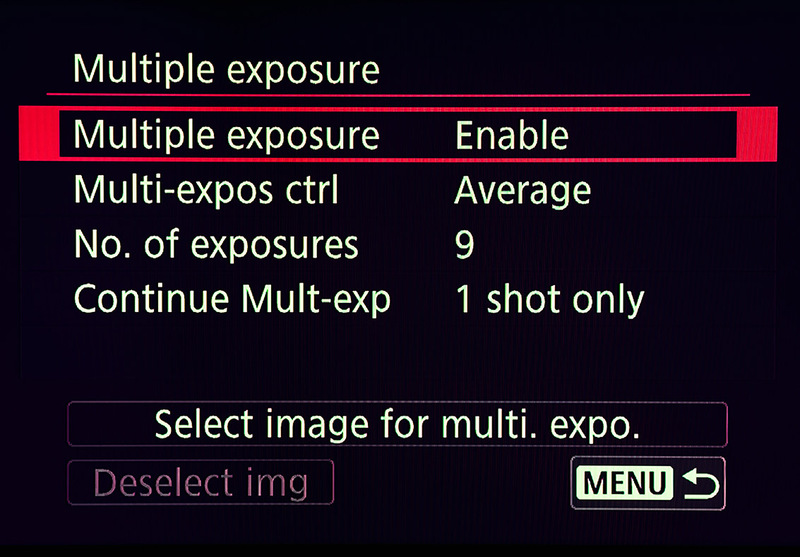 As such, exposures can now be many minutes long if needed. We can give the camera sensor as much signal as the darkness of the night sky allows. More signal equals less noise in the final images. In addition, there are no contrasty, dark shadows where noise lurks. Indeed, the subjects of deep-sky images are often so low in contrast, as here, they require aggressive contrast boosting later in processing to make a dramatic image. While that post-processing can bring out artifacts and camera flaws, as a rule I never see the great increase in noise, banding, and magenta casts I sometimes encounter when processing short-exposure nightscape scenes. 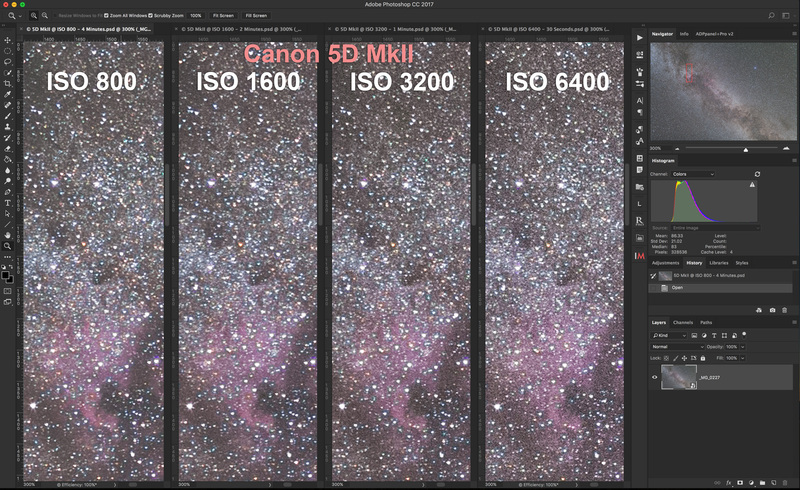 The Canon 6D MkII at four typical ISO speeds in tracked exposures. 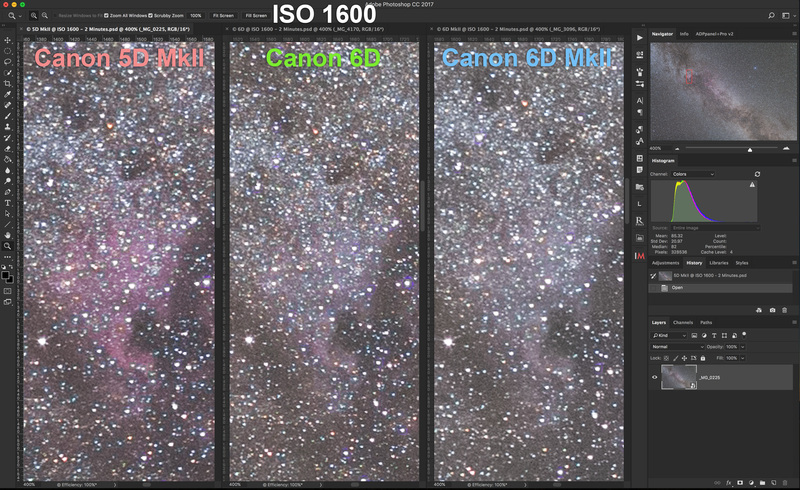 The original Canon 6D at four typical ISO speeds in tracked exposures. A Canon 5D MkII that has been filter-modified at four typical ISO speeds in tracked exposures. I shot at four ISO speeds typical of deep-sky images: 800, 1600, 3200, and 6400. Exposures were 4 minutes, 2 minutes, 1 minute, and 30 seconds, respectively, to produce equally exposed frames with a histogram shifted well to the right, as it should be for a good signal-to-noise ratio. Noisy deep-sky images with DSLR cameras are usually the result of the photographer underexposing needlessly, often in the mistaken belief that doing so will reduce noise when, in fact, it does just the opposite. The above set of three images compares each of the three cameras at those four ISO speeds. In all cases I have applied very little processing to the images: only a lens correction, some sharpening, a slight contrast and clarity increase, and a slight color correction to neutralize the background sky. However, I did not apply any luminance noise reduction. So all the images are noisier than what they would be in a final processed image. Even so, all look very good. And with similar performance. All frames were shot with Long Exposure Noise Reduction (LENR) on, for an automatic dark frame subtraction by the camera. I saw no artifacts from applying LENR vs. shots taken without it. The 6D and 6D MkII perhaps show a little less noise than the old 5D MkII, as they should being newer cameras. The 6D MkII also shows a little less pixelation on small stars, as it should being a 26 megapixel camera vs. 20 to 21 megapixels for the older cameras. However, you have to examine the images at pixel-peeping levels to see these differences. Nevertheless, having higher resolution without the penalty of higher noise is very welcome. The three cameras compared at ISO 1600. Note the histogram and region of the frame we are examining up close. The three cameras compared at ISO 3200. Note the histogram and region of the frame we are examining up close. The three cameras compared at ISO 6400. Note the histogram and region of the frame we are examining up close. Above, I show images from the three cameras side by side at ISOs 1600, 3200, and 6400. It is tough to tell the difference in noise levels, the key characteristic for this type of astrophotography. The new 6D MkII shows very similar levels of noise to the 6D, perhaps improving upon the older cameras a tad. 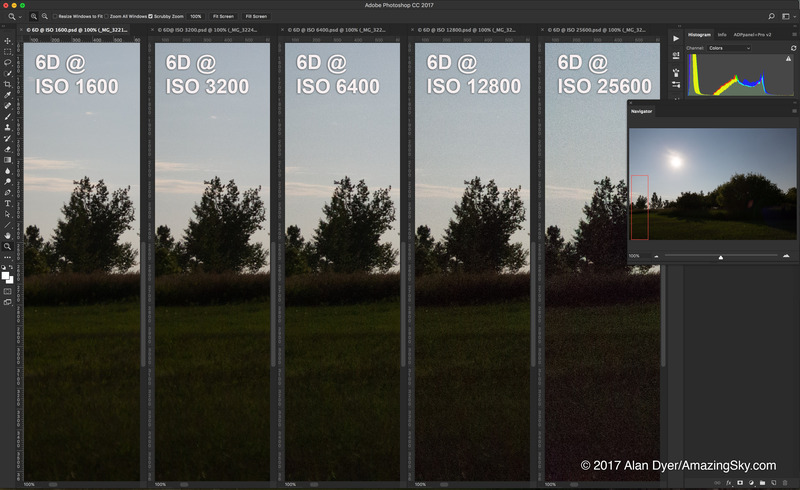 Because images are well-exposed (note the histogram at right), the 6D MkII is showing none of the flaws of its lower dynamic range reported elsewhere. That’s the key. The 6D MkII needs a well-exposed image. Given that, it performs very well. The three cameras in stacked and processed final images. This version shows the same images but now with stacked frames and with a typical level of processing to make a more attractive and richer final image. Again, all look good, but with the modified camera showing richer nebulosity, as they do in deep-sky images. 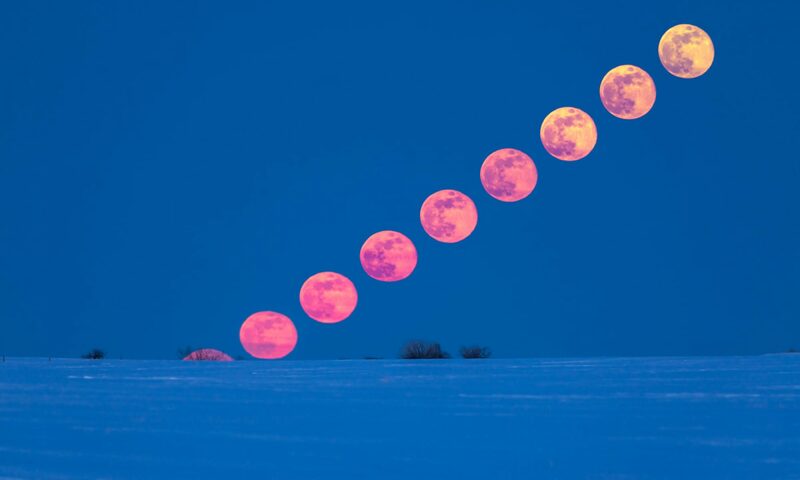 The lead image at the very top is a final full-frame image with the Canon 6D MkII. As such, based on my initial testing, I can recommend the Canon 6D MkII (and plan to use it myself) for deep-sky photography. Indeed, I’ll likely have the camera filter-modified to replace my vintage yet faithful 5D MkII for most of my deep-sky shooting. The 6D MkII’s tilting LCD screen alone (a neck, back, and knee saver when attached to a telescope!) makes it a welcome upgrade from the earlier cameras. I make use of this undocumented feature all the time to ensure cleaner images in long deep-sky exposures, as it produces and subtracts dark frames with far greater accuracy than any taken later and applied in post-processing. I hope you’ve found this report of interest. With the 6D MkII so new, and between smoky skies and the interference of the Moon, I’ve had only one night under dark skies to perform these tests. But the results are promising. In a technical blog I compare the new Canon 6D Mark II camera with its predecessor, the Canon 6D, with the focus on performance for nightscape astrophotography. No pretty pictures in this blog I’m afraid! This is a blog for gear geeks. The long-awaited Canon 6D Mark II camera is out, replacing the original 6D after that camera’s popular 5-year reign as a prime choice among astrophotographers for all kinds of sky images, including nightscapes and time-lapses. As all new cameras do, the 6D Mark II is currently fetching a full list price of $2000 U.S. Eventually it will sell for less. The original 6D, introduced in 2012 at that same list price, might still be available from many outlets, but for less, likely below $1500 US. Shown on the left, above, the 6D Mark II is similar in size and weight to the original 6D. However, the new Mark II offers 6240 x 4160 pixels for 26 megapixels, a bump up in resolution over the 5472 x 3648 20-megapixel 6D. The pixel pitch of the Mark II sensor is 5.7 microns vs. 6.6 microns for the 6D. One difference is that the port for a remote release is now on the front, but using the same solid 3-pin N3 connector as the 6D and other full-frame Canons. That makes it compatible with all external controllers for time-lapse shooting. My interest is in a camera’s performance for long-exposure astrophotography, with images taken at high ISO settings. I have no interest in auto-focus performance (we shoot at night with focus set manually), nor how well a camera works for high-speed sports shooting. To test the Mark II against the original 6D I took test shots at the same time of a high-contrast moonlit scene in the backyard, using a range of ISO speeds typical of nightscape scenes. The comparisons show close-ups of a scene shown in full in the smaller inset screen. The key characteristic of interest for night work is noise. 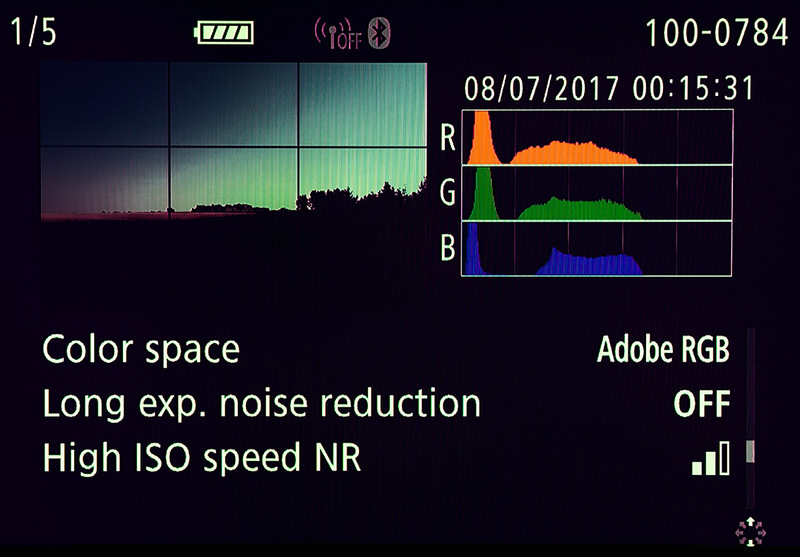 How well does the camera suppress the noise inherent in digital images when the signal is boosted to the high ISO settings we typically use? This set shows the 6D MkII at five ISOs, from ISO 1600 all the way up to the seldom-used ISO 25,600, all shot in Raw, not JPG. In all cases, no noise reduction was applied in later processing, so the results do look worse than what processed images would. Click or tap on all images to expand each image to full screen for closer inspection. 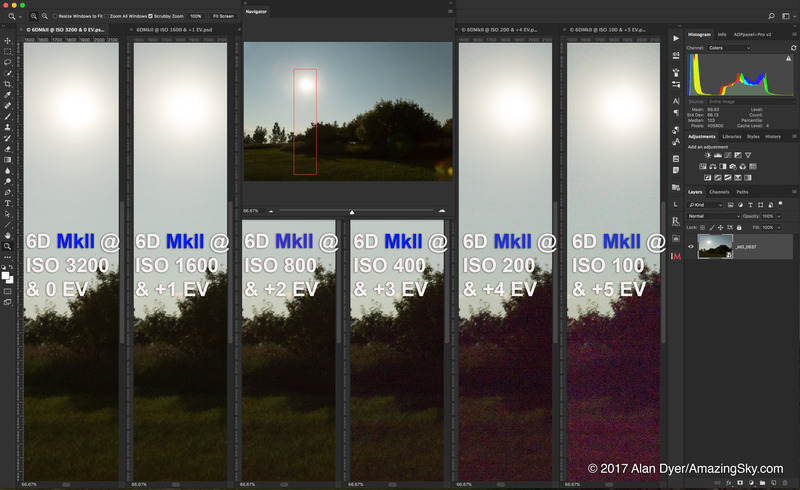 This set shows the same range of ISOs with the original 6D. All were taken at the same aperture, f/2.8, with a 35mm lens. Exposures were halved for each successive bump up in ISO speed, to ensure equally exposed images. 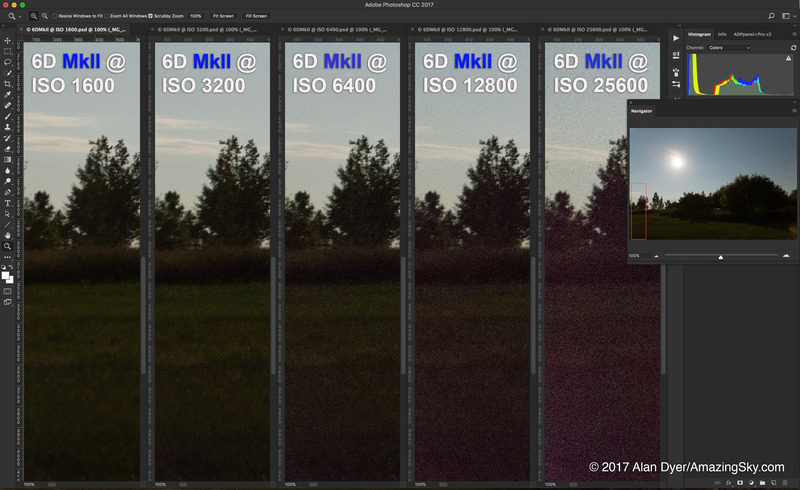 Comparing the sets, the 6D MkII shows a much greater tendency to exhibit a magenta cast in the shadows at very high ISOs, plus a lower contrast in the shadows at increasing ISOs, and slightly more luminance noise than the 6D. How much more noise the 6D MkII exhibits is demonstrated here. To me, visually, the MkII presents about 1/2 stop, or EV, worse noise than the 6D. In this example, the MkII exhibits a noise level at ISO 3200 (a common nightscape setting) similar to what the 6D does if set between ISO 4000 and 5000 – about 1/2 stop worse noise. Yes, the MkII has a higher pixel count and therefore smaller pixels (5.7 microns in this case) that are always more prone to noise. But in the past, advances to the in-camera signal processing has prevented noise from becoming worse, despite increasing pixel count, or has even produced an improvement in noise. For example, the 2012-vintage 6D is better for noise than Canon’s earlier 2008-era 5D MkII model by about half a stop, or EV. After five years of camera development I would have expected a similar improvement in the 6D MkII. 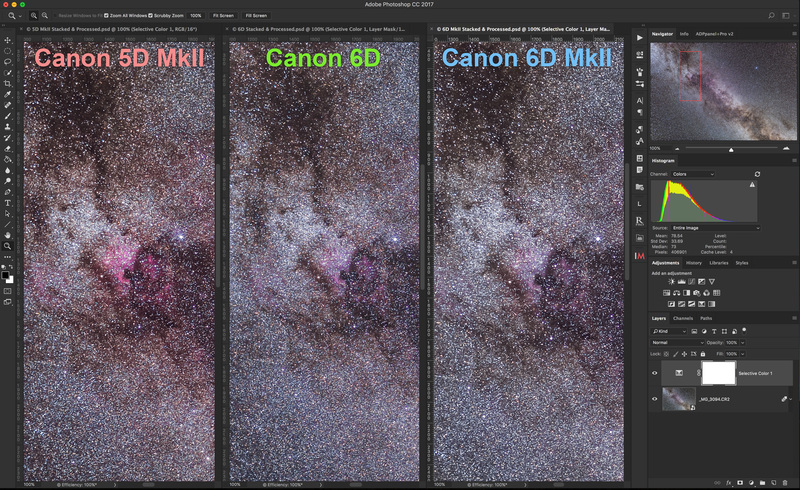 After all, the 6D MkII has Canon’s latest DIGIC 7 processor, vs. the older 6D’s DIGIC 5+. Instead, not only is there no noise improvement, the performance is worse. That said, noise performance in the 6D MkII is still very good, and better than you’ll get with today’s 24 megapixel cropped-frame cameras with their even smaller 4 micron pixels. But the full frame 6D MkII doesn’t offer quite as much an improvement over cropped-frame cameras as does the five-year-old 6D. In the previous sets all the images were well-exposed, as best they could be for such a contrasty scene captured with a single exposure. What happens when Raw images are underexposed, then boosted later in exposure value in processing? This is not an academic question, as that’s often the reality for nightscape images where the foreground remains dark. Bringing out detail in the shadows later requires a lot of Shadow Recovery or increasing the Exposure. How well will the image withstand that work on the shadows? To test this, I shot a set of images at the same shutter speed, but at successively slower ISOs, from a well-exposed ISO 3200, to a severely underexposed ISO 100. I then boosted the Exposure setting later in Raw processing by an amount that compensated for the level of underexposure in the camera, from a setting of 0 EV at ISO 3200, to a +5 EV boost for the dark ISO 100 shots. This tests for a camera’s “ISO Invariancy.” If a camera has a sensor and signal processing design that is ISO invariant, a boosted underexposed image at a slow ISO should look similar to a normally exposed image at a high ISO. You’re just doing later in processing what a camera does on its own in-camera when bumping up the ISO. But cameras that use ISO “variant” designs suffer from increased noise and artifacts when severely underexposed images are boosted later in Raw processing. The Canon 6D and 6D MkII are such cameras. This set above shows the results from the 6D Mark II. Boosting underexposed shadows reveals a lot of noise and a severe magenta cast. These are all processed with Adobe Camera Raw, identical to the development engine in Adobe Lightroom. This set above shows the results from the 6D. The older camera, which was never great for its lack of ISO Invariancy performance, is still much better than the new Mark II. Underexposed shadows show less noise and discolouration in the 6D. For a comparison of the Canon 6D with the ISO Invariant Nikon D750, see my earlier Nikon vs. Canon blog from 2015. The Nikon performs much better than the 6D. Effectively, this is the lack of dynamic range that others are reporting when testing the 6D MkII on more normal daytime images. It really rears its ugly head in nightscapes. The lesson here is that the Mark II needs to be properly exposed as much as possible. Don’t depend on being able to extract details later from the shadows. The adage “Expose to the Right,” which I explain at length in my Nightscapes eBook, applies in spades to the 6D MkII. All the above images were taken with Long Exposure Noise Reduction (LENR) off. This is the function that, when turned on, forces the camera to take and internally subtract a dark frame – an image of just the noise – reducing thermal noise and discolouration in the shadows. 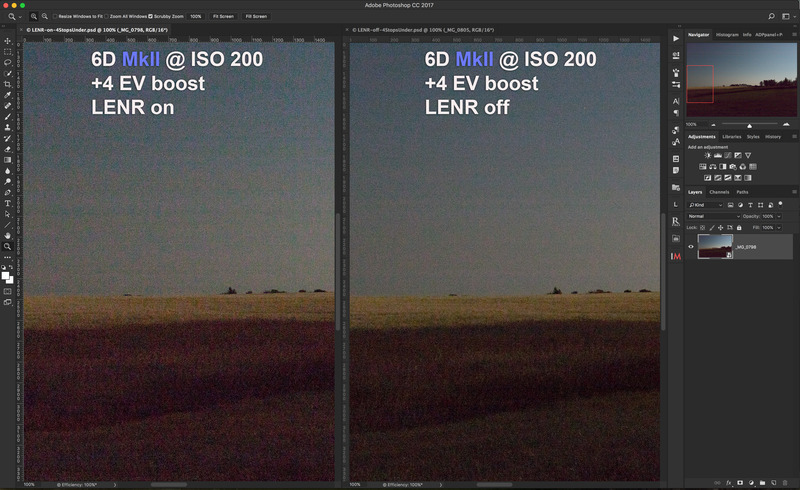 Here is the 6D Mark II in a pair of underexposed images at identical settings with LENR on and off. Not only did it not reduce noise and the magenta cast, using LENR made it worse. This is so completely contrary to expectation that I wonder if the Mark II does not have a serious firmware issue in need of a fix in an upgrade. A unique feature of Canon full-frame cameras is that when LENR is on you can take several exposures in quick succession before the dark frame kicks in and locks up the camera. This is extremely useful for deep-sky shooting. The 6D Mark II, when in either Raw or in Raw+JPG can take 3 shots in succession. This is a downgrade from the 6D which can take 4 shots when in Raw+JPG. Pity. My next thought was that Adobe Camera Raw, while it was reading the Mark II files fine, might not have been de-Bayering or developing them properly. 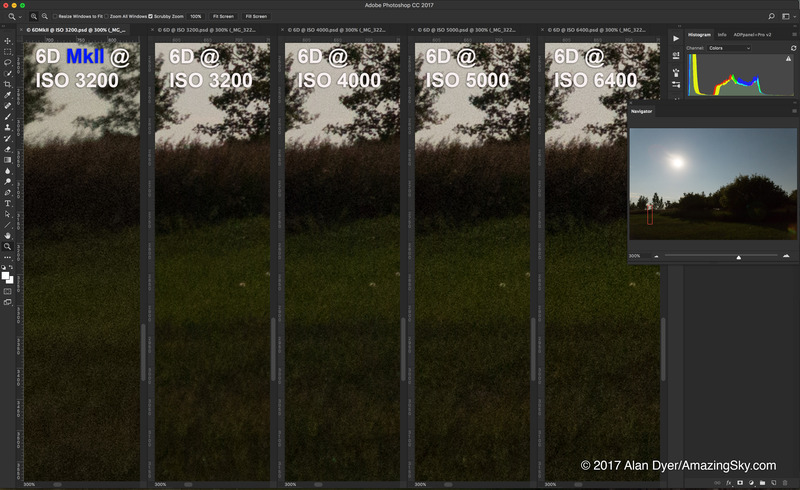 So I developed the same image with both Raw developers, Adobe’s and Canon’s latest version of their own Digital Photo Professional (DPP). Yes, DPP did do a better job at eliminating the ugly magenta cast, but did a much worse job at reducing overall noise. 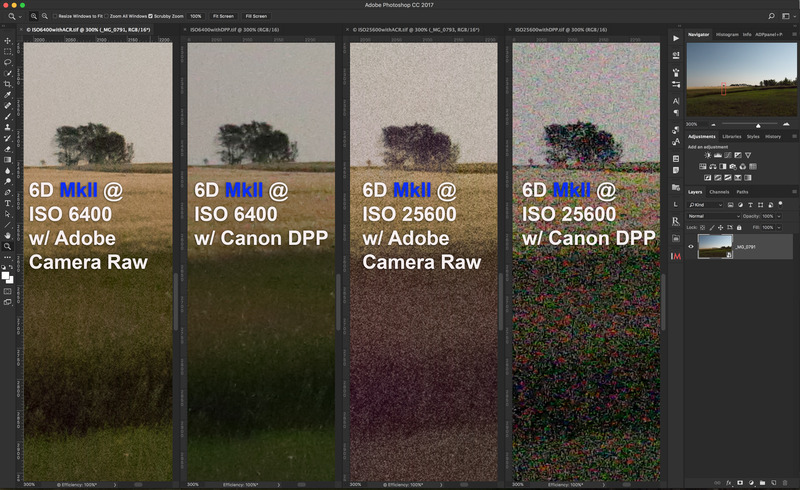 DPP shows a lot of blockiness, detail loss, and artifacts left by the noise reduction. Adobe Camera Raw and/or Lightroom remain among the best of many Raw developers. A new feature the 6D Mark II offers is the ability to shoot and stack images in-camera. 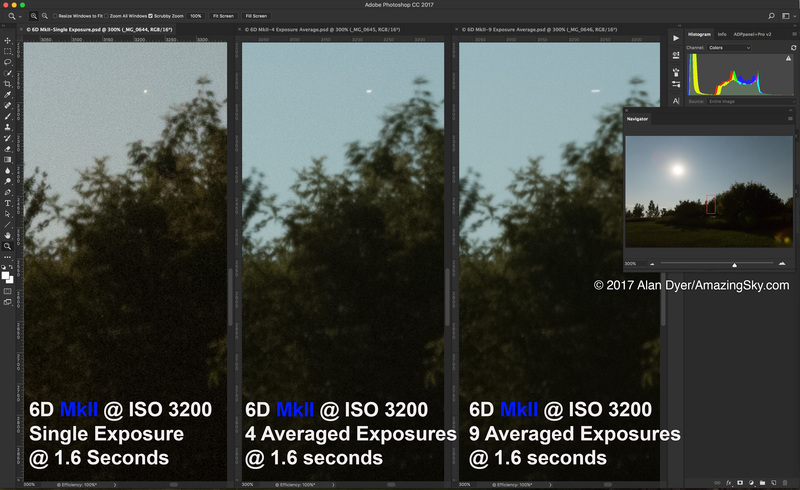 It can either “Add” the exposure values, or, most usefully, “Average” them, as shown here. Other newer Canon DSLRs also offer this feature, notably the 7D MkII, the 5D MkIV, the 5Ds, and even the entry-level 80D. So the 6D MkII is not unique. But the feature was not on the 6D. The left image is a single exposure; the middle is an average stack of 4 exposures stacked in camera; the right image an average stack of 9 exposures, the maximum allowed. Noise smooths out a lot, with less noise the more images you stack. The result is a single Raw file, not a JPG. Excellent! While this kind of stacking can be done later in processing in Photoshop, or in any layer-based program, many people might find this in-camera function handy. Except, as you can see, the sky will exhibit star trails, and not as well defined as you would get from stacking them with a “Lighten” blend mode, as all star trail stacking routines use. So this averaging method is NOT the way to do star trails. The Mark II does not offer the Brighten mode some other new Canons have that does allow for in-camera star trail stacking. Again, a pity in a camera many will choose for astrophotography. Nevertheless, the Average mode is a handy way to create foreground landscapes with less noise, which then have to be composited later with a sky image or images. 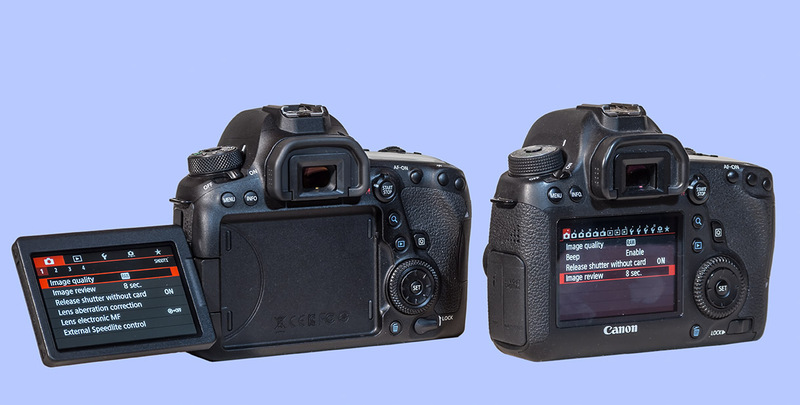 On the left, below, the Mark II has a nearly identical layout of buttons and controls to the 6D on the right. So owners of the older model will feel right at home with the Mark II. That’s handy, as we astrophotographers work in the dark by feel! Of course the big new feature, a first for Canon in a full-frame camera, is the Mark II’s fully articulated screen. It flips out, tilts, and even flips around to face forward. 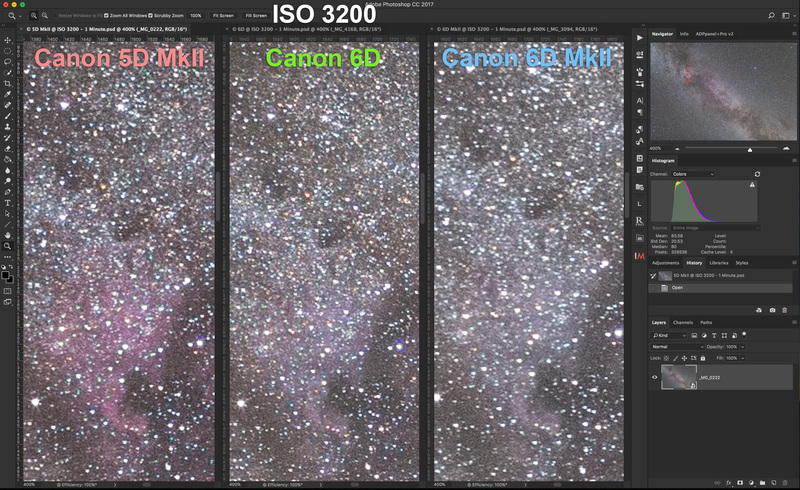 This is super-great for all astrophotography, especially when conducted by aging photographers with aching backs! And the screen, as with the entry-level cropped-frame Canons, is a touch screen. For someone who hasn’t used one before – me! – that’ll take some getting used to, if only in just remembering to use it. And it remains to be seen how well it will work in the cold. But it’s great to have. Like other late-model Canon DSLRs, the 6D MkII has a built-in intervalometer. It works fine but is useable only on exposures with internally set shutter speeds up to 30 seconds. However, setting the Interval so it fires the shutter with a minimal gap of 1 second between shots (our usual requirement for night time-lapses) is tricky: You have to set the interval to a value not 1 second, but 2 to 3 seconds longer than the shutter speed. i.e. an exposure of 30 seconds requires an interval of 33 seconds, as shown above. Anything less and the camera misses exposures. Why? Well, when set to 30 seconds the camera actually takes a 32-second exposure. Surprise! Other cameras I’ve used and tested with internal intervalometers (Nikon and Pentax) behave the same way. It’s confusing, but once you are used to it, the intervalometer works fine. Except … the manual suggests the only way to turn it off and stop a sequence is to turn off the camera. That’s crude. 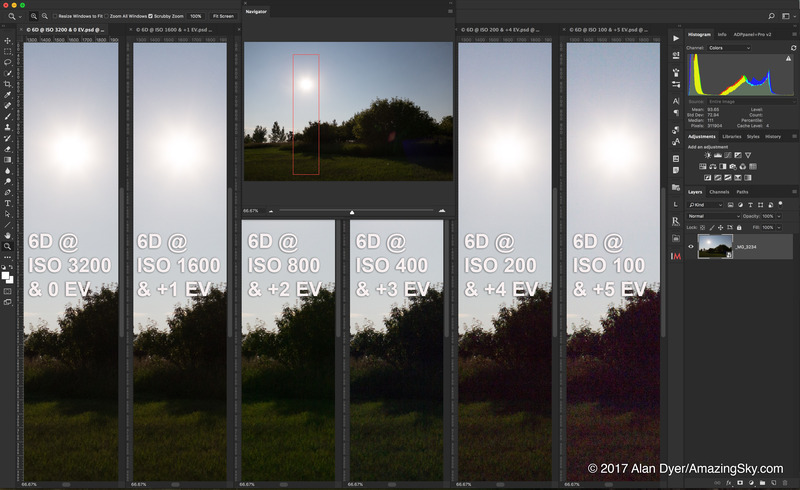 A reader pointed out that it is also possible to stop a time-lapse sequence by hitting the Live View Start/Stop button. However, that trick doesn’t work on sequences programmed with only a second between frames, as described above. So stopping a night time-lapse is inelegant to say the least. 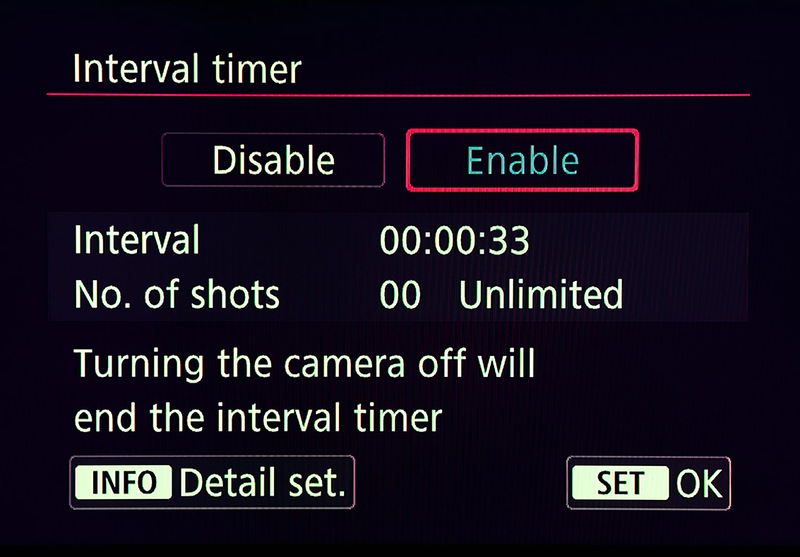 With Nikons you can hold down the OK button to stop a sequence, with the option then of restarting it if desired. Also, the internal Intervalometer cannot be used for exposures longer than 30 seconds. Again, that’s the case with all in-camera intervalometers in other models and brands. As with many other new Canons, the Mark II has a Bulb Timer function. 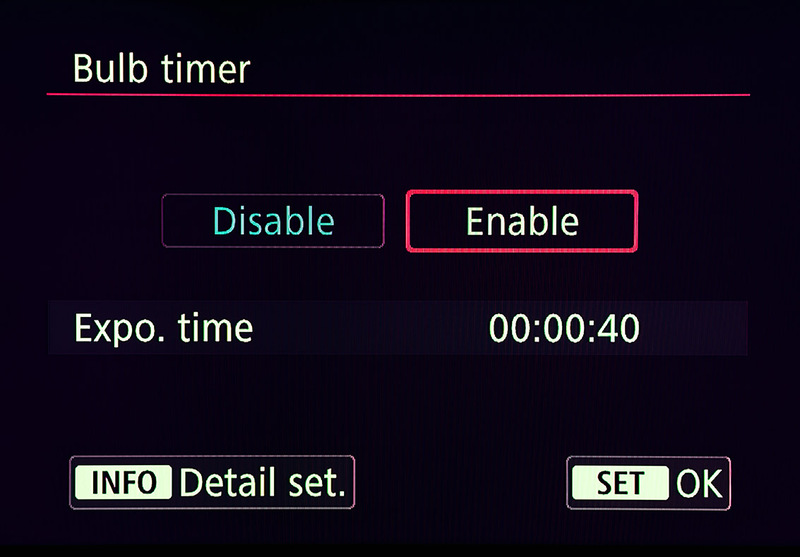 When on Bulb you can program in exposure times of any length. That’s a nice feature that, again, might mean an external intervalometer is not needed for many situations. A new feature I like is the greatly expanded information when reviewing an image. One of the several screens you can scroll to shows whether you have shot that image with Long Exposure Noise Reduction on or not. Excellent! I have long wanted to see that information recorded in the metadata. Digital Photo Professional also displays that status, but not Adobe Camera Raw/Lightroom. 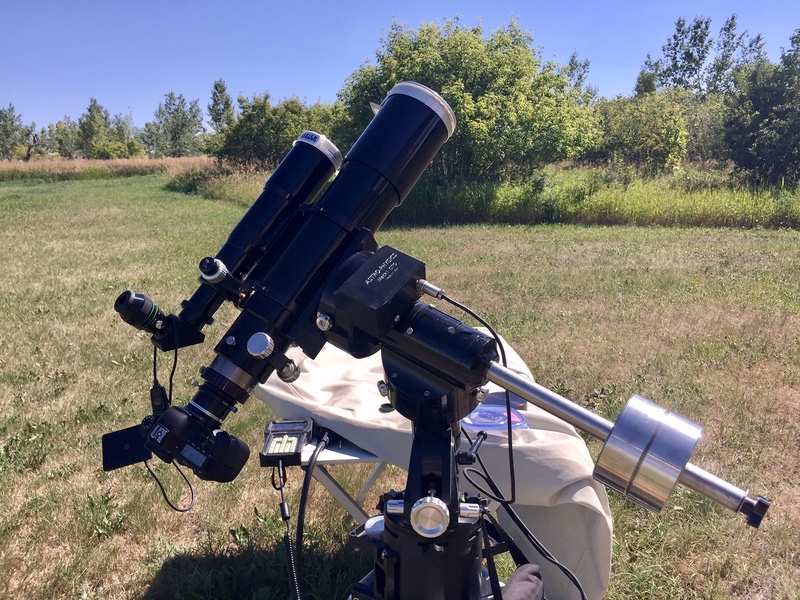 While this has been a long report, this is an important camera for us astrophotographers. I wish the news were better, but the 6D Mark II is somewhat of a disappointment for its image quality. It isn’t bad. It’s just that it isn’t any better than than the older 6D, and in some aspects is worse. The 6D Mark II as part of the rig for shooting the total solar eclipse. The articulated screen will be very nice! Canon has clearly made certain compromise decisions in their sensor design. Perhaps adding in the Dual-Pixel Autofocus for rapid focusing in Movie Mode has compromised the signal-to-noise ratio. That’s something only Canon can explain. If you are a Canon user looking to upgrade to your first full-frame camera, the 6D Mark II will provide a noticeable and welcome improvement in noise and performance over a cropped-frame model. But an old 6D, bought new while they last in stock, or bought used, will be much cheaper and offer slightly less noise. But the Mark II’s flip-out screen is very nice! If you are a current 6D owner, upgrading to a Mark II will not get you better image quality, apart from the slightly better resolution. Noise is actually worse. But it does get you the flip-out screen. I do like that! If you are not wedded to Canon, but want a full-frame camera for the benefits of its lower noise, I would recommend the Nikon D750. I have one and love it. I have coupled it with the Sigma Art series lenses. I have not used any of the Sony a7-series Mirrorless cameras, so cannot comment on their performance, but they are popular to be sure. However, I hope this review aimed specifically at nightscape shooters will be of value. I have yet to test the 6D Mark II for very long-exposure tracked deep-sky images.